I’m a big fan of fried chicken but it takes a while to fry and leaves me with a greasy mess in the kitchen. The next best thing is oven-fried chicken. It probably wasn’t a “pretty” dish setting on our dinner table but it made up for it in good taste. I’m not saying this is as delicious as deep-fried chicken but it’s healthier and was really moist and delicious. The breading makes the chicken juicy on the inside and crisp on the outside. And it’s not greasy! If there is any leftover, it’s great the next day cut up in a salad! Dip chicken in melted butter. Bake at 350 degrees for 30-35 minutes or until tender. Visit my friend Linda’s blog @My Kind of Cooking for great tips, recipes and cookbook giveaway! For a chance to win my friend Bo’s great Le Crueset giveaway, visit Bo’s Bowl! We all relish potato pancakes but, I usually dreaded making them ~ I knew there would be blood from the shredding. Not any more! Bill and Bubba have been asking all winter how much longer do they have to wait for me to make potato pancakes and now that it’s spring, I finally made them. I thought about using frozen shredded potatoes but they need to be thawed and dried well before using, which still leaves them with excess moisture. Then I recalled seeing green bags of fresh potatoes in the dairy case at the market. Eureka! “Simply Potatoes” makes Shredded Hash Browns! Perfect! It only took making stops at 3 stores to find a couple of bags which to me is way better than shredding potatoes on a grater and seeing my fingers shredded. And, no way would I use a mandolin; it was too scary for me and was stashed in the garage after one use because I can be a “kitchen klutz”. So, that makes me a “chicken kitchen klutz”, I guess! These potato pancakes were a scrumptious hit! This is a simple recipe made easy by using the shredded “Simply Potatoes.” I served them with applesauce and crisp fried bacon, so naturally they’re fried in bacon grease. In a large bowl, mix potatoes, onion, flour, baking powder, salt and pepper. In a small bowl, whisk egg just until blended. Pour egg into potato mixture and stir until combined. Drop 1/4 cup potato batter into hot oil and flatten slightly. Can keep warm in a 200 degree oven until they are all fried. I’m sure there are many versions of this recipe out there in the “www” for this dish; in fact Bubba himself has a great recipe for it; but, this time I wanted a biting amalgamation of ingredients. This enchilada casserole includes a good dose of chili powder and cayenne pepper added to the meat for that spicy Mexican flavor; the velvety texture of black beans and plenty of melted cheese to top it off. If you like enchiladas but aren’t thrilled with making your own, my easy one-dish casserole would make a great meal for your family and friends. There is definitely enough to feed several people! Place ground beef and onion in a large skillet on medium heat and cook until beef is done. Add garlic and chili powders and cayenne pepper. In a large bowl, combine 1 cup of cheddar cheese and remaining ingredients. Add ground beef mixture and mix well. In a large casserole dish coated with cooking spray, arrange a layer of tortillas. Spoon a layer of meat mixture over tortillas. Repeat layers twice, ending with meat as last layer. Bake at 350 degrees for 45 minutes to one hour. Garnish with black olives and sour cream. It’s still chilly in this area and I’m still cooking heartier dishes even though spring is officially here now. Turnips just may be the most underrated of vegetables. If you aren’t crazy about them, I hope this recipe will change your mind! Pairing turnips with potatoes is like a marriage made in heaven! With one bite, you can have the subtle bitter, yet slightly sweet taste of the turnip and the earthy flavor of the potato. Let them mingle with salty smoky bacon and they ooze an intense goodness. This is a simple recipe with the wine vinegar and sugar adding a tasty sweet/sour sauce to the vegetables and bacon. There are a lot of pleasant flavors going on in this recipe and here’s hoping you give it a try ~ it’s a cinch to make! In small bow, mix vinegar and sugar. Set aside. Sauté bacon until crisp. Set aside. Add onion and garlic to skillet, cook until tender. Add potatoes and turnips and sprinkle with salt and pepper. On medium-low heat, cover and cook until almost tender, stirring frequently, about 15-20 minutes. Pour vinegar mixture over vegetables and toss. Continue cooking until browned and slightly crisp, another 8 minutes or so. I swoon over white bean soup and this recipe for it is fantastic! I swoon over white bean soup and this recipe for it is fantastic! Bean soup was at the top of the list of my favorite meals when I was young and still is today. When I was a kid, I loved to be at Grandma’s for Saturday supper since she served bean soup; generally with a ham bone, every Saturday evening year round ~ along with cornbread and iced sweet tea. Sometimes, I like bean soup jazzed up and spicy. So, this time I cooked it with andouille sausage. Bill bought links of it at our great Italian meat market the other day and it has been driving me crazy; smelling the aromatic flavors every time I opened the refrigerator so I could hardly wait to cook it in this soup. The rich spicy flavor of the sausage is Cajun all the way and a great addition to the beans. And since I like spinach almost as much as Popeye does, I included a whole bag of it in the soup. It’s a tasty soup for supper any evening, plus the dried beans are a great source of protein and easy on your food budget also. Cooking it in a slow cooker makes it so easy with not having to stir it periodically. And of course, bean soup demands fresh baked corn bread ~ a perfect meal in my way of thinking. The bean soup is possibly even better the next day! In 6 quart slow cooker, combine the beans, sausage, onion, carrots and thyme. Add broth and stir to combine. Cover and cook until the beans are tender, on low for 7-8 hours or on high for 4-5 hours. Before serving, add the spinach leaves and cover. Cook until the spinach is tender, about 15-20 minutes. Add the vinegar and salt and pepper. If you are a white bean soup fanatic like me, you will love this soup. It is absolutely perfectly delicious, I am not kidding!!! There was no doubt in my mind that sooner or later I’d do this and I didn’t let myself down! The chicken baked, I took it out of the oven and snapped some photos of it in the baking dish. Then I gobbled the chicken down before I realized I did not take a photo of it with the succulent mushrooms on a plate. Sometimes I just get too wrapped up in the eating and forget what I’m supposed to be doing! Yum ~ the appeal of sour cream! It gives food a great tang and was just right for the chicken when I served it over rice; noodles work just as well. If you’re afraid of the fat content in sour cream, try low-fat sour cream or even yogurt with this recipe. This dish is simple and good ~ turning the chicken into a saporous dish! Place sour cream, chicken broth, salt, pepper and paprika in a bowl and combine well. Arrange chicken breasts in a baking dish. Spread sour cream/mushroom mixture over top. Cover with foil and bake at 350 degrees for about 30 minutes. Remove foil, continue baking until chicken is tender, about another 15-20 minutes. It’s creamy, moist and delicious! First off: for those of you who have asked about our adorable grandson Matthew, I thank you so much for thinking of him! Matthew is 4 weeks old now, weighing in at 8 pounds, 6 ounces and is a sweet delight. That’s Daddy holding him in the picture and his babysitter Coco supervising. Kathy brought 2 adorable Soft Coated Wheaten Terriers along with her when she married our son Matt. Coco, the younger one, is amazing with the baby! She leaves Matthew’s side only for the essentials and tries her best to get her licks in every chance she gets. When we hold Matthew, the look on her face begs us, “Please let me have him ~ I know I could do better!” I know Matthew and Coco will be best friends as Matthew grows up, and Bella also, who leaves the babysitting to Coco most of the time. I guarantee you’ll like these salmon patties if you adore salmon the way I do! This recipe is from an old friend and it is chocked full of flavorful ingredients to go with the canned salmon ~ corn kernels, Dijon mustard and paprika, for starters. Mom used to make them but just added eggs, cracker crumbs and onion. This is not my mom’s salmon patties! The corn adds a crispy sweetness with the Dijon mustard and lemon juice adding zesty flavors. I used “pink” salmon. Refrigerating the patties for an hour ensures that they will not crumble when fried. These are simple and easy to make for fast dinner. Just flip them carefully when frying! I really like salmon straight out of the can! Do you? Place salmon in a large bowl and combine with onion, corn and pepper. In a small bowl, combine the mayonnaise, mustard, lemon juice, Worcestershire and hot sauces and paprika. Gently fold into salmon mixture. Fold into the salmon mixture along with ½ cup of the cracker crumbs. Place remaining crumbs on large plate. Form the salmon mixture into 8 patties. Coat them with the panko bread crumbs carefully. Refrigerate, loosely covered, for one hour. Cook the patties 3-4 minutes per side, pressing down on them slightly with the spatula. Add more oil or butter if necessary. They’re tasty ~ scrumptiously good!!! Update- Bella passed away March, 2017, 12 years old. We really enjoy a meal of crisp-fried catfish with a couple of hush puppies on the side at a fish fry, but my taste buds told me this recipe is a great alternative without all the calories and fat. People probably avoid eating baked catfish because they think it will end up “mushy” or “fishy.” That’s definitely not the case with the farm-raised catfish baked using this recipe as it has the delicious crunch of batter-fried catfish on the outside, while being succulently tender on the inside with a flavor to die for. This simple recipe is from Cooking Light Cookbook. The catfish gets a double dose of flavor from the ranch dressing and Parmesan-cornmeal coating. Combine dressing and egg whites in a small bowl, and stir well with a whisk. Combine cornmeal and next 4 ingredients in a shallow dish. Dip fish in egg white mixture; dredge in cornmeal mixture. Bake at 425 degrees for 12 minutes on each side or until lightly browned and fish flakes easily when tested with a fork. Serve with lemon wedges or light tartar sauce. Per serving: calories-313; fat-9 grams; carbohydrates-14.3 grams. This recipe combines one of the great flavors of the South ~ cornbread ~ with spicy Mexican flavors. It’s exactly like having salsa with your cornbread and meat. I came across this in my Better Homes and Gardens Cookbook and couldn’t wait to try this homey quick recipe. It’s a zippy ground beef dish with the added goodness of tomatoes, corn and cheese. Covering it all is a smooth layer of corn bread. If you like cornbread and Mexican food, you’ll like this spicy dish! ¼ cup each of sliced green olives, black olives and pimentos. Add beef to a very large skillet. Season with chili and garlic powders, salt and pepper. Sauté beef until brown; drain off fat. Stir in undrained tomatoes and corn; heat through. In a medium bow, combine cornmeal, flour, baking powder, sugar and salt. Stir in egg, milk and oil. Spread evenly on beef mixture. Sprinkle with remaining 3 tablespoons cheese. Bake, uncovered about 30-35 minutes or until topping is set. Scatter olive mixture over top. It’s a shame that the simpler cuts of meat are often the ones that are neglected by the food TV shows, restaurants and then by home cooks also, who pass over the not so fancy cuts of meat in their market. Cuts such as beef shanks are not only economical (mine were 89 cents per pound); they render inviting delectable flavors when cooked properly. 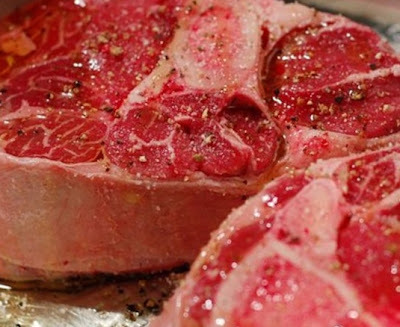 Braising is a great way to cook tougher cuts of meat. Braising is done by browning the meat on both sides in a hot skillet. This helps to seal the moisture inside the meat. Then the meat is placed in Dutch oven or pot with a lid and cooked with some liquid on low heat for a long time. The result is a juicy, tender dish with savory rich flavors. There are no shortcuts here with cooking time. Just like the turtle, the long slow cooking wins the race. It’s the lengthy cooking time in the pot that allows the meat and vegetables to coalesce into robust flavors. Bill and I devoured his dinner with gusto. The meat was so tender it fell off the bone with each bite. It is a succulent hearty dish for yet another chilly windy evening! Season beef shanks with salt and pepper. In a Dutch oven, heat olive oil over medium-high heat. Add beef shanks and brown on both sides. Remove beef from Dutch oven. Add onions, carrots and garlic to Dutch oven. Add wine and deglaze pan by scraping up any browned bits from the bottom. Add undrained tomatoes, beef broth and beef shanks to pan. Cover and bake 5 hours or until beef is tender. Add mushrooms the last 20 minutes of cooking time. Meanwhile, cook gnocchi and strain well. Remove beef shanks to a serving platter. Strain vegetables from cooking liquid and spoon over meat. Skim fat from cooking liquid and drizzle over beef shanks, vegetables and gnocchi. This dish is Midwest all the way! It’s simply a baked casserole containing a starch, meat, vegetables and canned soup that here in the Midwest we call a “hot dish.” The history of a hot dish goes back to the days when “budget-minded” wives needed to feed their families as well as their congregations in the church basement. This chicken and wild rice dish combines great texture and flavor and really hits the spot. It’s a versatile recipe to which you can add a cup of chopped celery, a can of sliced water chestnuts and a cup of walnuts or almonds, if you like. Or, add a can of French style green beans, chopped green pepper or a cup of cheddar cheese. I keep it pretty simple with few ingredients. It’s that time of year when we need a hearty entree like this to warm us up after being out in the cold weather. It’s a delicious hot dish that’s just as delicious left-over! Brown chicken in a nonstick skillet over medium-high heat. Remove from pan and cut into bite-size pieces. Add onion and garlic to pan. Sauté 2-3 minutes or until tender. Mix with chicken. Blend rice mix and remaining ingredients in a large greased casserole dish. Add chicken mixture and combine. Bake at 350 degrees for 35-45 minutes or until heated through.